My kids have been on summer vacation and, by extension, I have been too. Without the regular routine of getting kids ready for school in the mornings and picking them up in the afternoons, I never quite know what each day will bring and am letting things just happen when they happen. In some ways, I love this more relaxed pace of life. I love doing crossword puzzles with my kids without having to think about needing to send them off to do their homework. I love not having to drop everything at 3:15 so I can go do school pick-up. The down side is I’m getting nothing done. I can’t count on having long periods of uninterrupted time to photograph a recipe or write a blog post. Without a clear-cut stopping time each day, I tend to let the afternoon hours while away. And, if I were being completely honest, sometimes I just wanna be lazy – it is summer vacation after all. 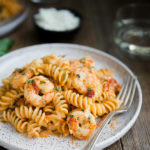 On those days, when I finally remember that I’m still responsible for making dinner, I’m glad to have recipes like this pasta with shrimp and feta in tomato cream sauce. On lazy summer evenings (or just any evening when you want dinner sooner rather than later), this is a good one to have in your recipe box. It came originally from a book called Back Pocket Pasta which I think is a perfect description. You can whip it out and be eating in about 30 minutes. Get the water boiling while gathering your ingredients and cook the pasta while you sauté the shrimp and simmer the sauce (I highly recommend buying shrimp that is already peeled for this). Then drain the pasta and toss it with the sauce, some feta (very important), and herbs. This is the kind of recipe where the measurements don’t have to be exact. You can eyeball most of it and still end up with a delicious dish, a key component when you’re feeling lazy. The only thing that would make this dinner more perfect is if I could get my kids to make it. I’ll have to get back to you on that one. Cook pasta until just al dente; drain well. Set aside. Heat olive oil in a large skillet over medium-high heat. Pat shrimp dry and then add to pan. Sauté shrimp until just opaque, about 2 minutes. Transfer shrimp to a plate. Add garlic and green onions to pan. Sauté until garlic and onions just begin to soften, about 2 minutes. Add oil as needed if the pan is too dry. Transfer to plate with shrimp. Reduce heat to medium. Stir in vermouth, chicken broth, cream, tomatoes, and tomato paste. Bring mixture to a simmer and cook 2-3 minutes or until mixture is slightly reduced and thickened. Increase heat to medium-high and add pasta. Toss until pasta is evenly coated with sauce. Season to taste with salt and pepper. Add shrimp mixture, feta cheese, parsley, and half of the basil. Toss to combine. Continue to cook until feta is almost melted in and mixture is heated through. Divide pasta among serving dishes and sprinkle with remaining chopped basil. Recipe adapted from Back Pocket Pasta cookbook via Cooking Light, April 2017. I love this as a nice, light meatless recipe! Everything you’ve made looks so fresh and delicious! I can’t wait to try! Thank you so much. I hope you do get to try it. I’ve made it for my family twice already and it’s been a big hit. I was surprised by how many servings this made. I think it’s the pound of shrimp in addition to the pasta.